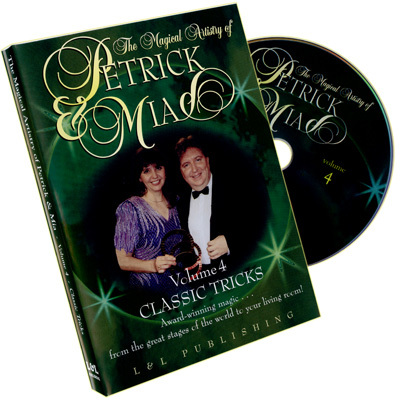 In this volume, Petrick & Mia perform and demonstrate many of their own original magic creations. If you've purchased any of these effects at their numerous lecture appearances, this will be the next best thing to personal instruction. If you don't own these dynamite effects, you'll certainly want to after watching the strong audience impact they have. Bewildering Bracelets - Two spring-style bracelets mysteriously link and unlink seemingly at the performer's will. Straw Through The Card - A true Petrick & Mia classic. A length of drinking straw penetrates a selected playing card leaving no hole or trace in the card. Ring on the Rope & Knotted Card - A borrowed finger ring, dropped into a bud vase, becomes magically knotted onto a length of rope. Likewise, a selected, signed card, placed into a small shopping bag, is also lassoed. Buzz Saw Card - A visible penetration of a playing card straight through the other 51! Coin Through Banknote - A jumbo coin passes through the center of a folded piece of currency. Lethal Teeth - A classic comedy card trick. A set of gag teeth finds two selected cards. The first card is found held tightly clenched by the teeth. The set of teeth finds the second card by apparently biting off a corner. When the teeth are opened, the corner that fits the card is found inside the jaws. Houdini Card Escape & Vertical Rise - A selected, signed card rises to the top of the deck while it's in the spectator's hands! Rings of Smoke - Three flat rings are linked and unlinked and finally penetrate a length of ribbon. Unbelievably, the rings are then passed out for examination!